La-La Land Crafts Release Challenge! at the park, at the beach, in the garden, in the sun! go check them out, and maybe win some too! so visit the La-La Land blog TODAY! So this card may not be all that clean & simple (the flower has 8 layers, not counting the button center or leaves! ), but I got the sketch (FTL 91) from the Clean & Simple Stamping blog so that's what I'm calling it! I used the Blossom Two Nestabilities (I just love that shape!) for my flower, cutting 4 pieces from the larger size and 4 pieces from the smaller size. 2 of the pieces of each size are the dotted paper and the other 2 pieces are white tulle. Next I sponged some Distress Ink on the paper flowers and then crumpled them up. I uncrumpled the layers then stacked them how I wanted and added the pearl button for a center. The leaves were handcut, sponged and crumpled. All papers are from the DCWV La Creme stack and the sentiment is from the Bloom set from There She Goes. This card is also for Timeless Tuesday - make your own flowers and ABC Challenge - V is for Vintage. I hope you like it and TFL! If you're looking for the Your Next Stamp Challenge #17, it's the post directly below this one. Thanks! It's time for another La-La's Weekly Wednesday Challenge! This week our theme was chosen by 1LuvnMama and is "Nestabilities Shaped Card" - the shape of your card should be the shape of whatever Nestabilities you choose. I used Princess Lala and some old papers from Imaginisce. I stamped Lala, then stamped over her with the frame stamp (Papertrey Ink) and let dry. I colored her in, but because I tend to do short choppy strokes when I color hair, I noticed that I went out of the lines quite a bit. So then I cut out just her head and put it aside. I stamped Lala and the frame again, colored Lala's dress and neck (and a little of her face and hair to keep it from being stark white under the popped up head), then cut just outside the line of the inner frame. I stamped the frame again on the dotted paper and used the matching Nestie to cut it out. I glued the cut out frame portion over the dotted frame, and then used a foam booster to attach the extra head. Finally, I stamped, colored and glittered, then cut out an extra crown and popped it up with tiny bits of cardstock. Pixie Dust Studio - add a pearl to your project. Before I go, I want to let you know that whatever image the hostess uses on her project is 20% off for the week of the challenge, and this week it's Lala with Bunny! And since we have a new requirement that you must use a La-La Land Crafts image on your projects, don't forget that we have all these fabulous digi images available now! Yay! I have another Your Next Stamp Challenge today! But before I get to the challenge, I wanted to let you know that we have some new releases coming soon so Karen has a fun contest on her blog. Check it out and you could win a special new release prize package! I used the awesome Mini Greetings set (it has 18 images and 21 greetings - you can make loads of different cards with this one set!) and a couple papers from the Basic Grey Urban Prairie paper pad. One tab is glued under the flower center and the other tab is glued to the back of the bee. The bee just kind of hovers over the flower instead of being glued right to it. And isn't the detail of the flower center interesting? It's just a silk flower that I got a million years ago in a scrapbook kit - yay for using really old stash!! I have a non-DT card for you today! Jessica of There She Goes does this really cool technique sometimes - you stamp a line art image with a colored ink for the background, then add an image which has been colored and cut out (and usually popped up) on top of the background image. It's this week's challenge on the There She Goes blog and I really love the look so I had to play! The sketch is from Sketchy Thursday and I used the Fairy Good Day stamp set (so cute!). Just a little note - the little fairy village image actually has 2 tiny little fairies included, but I didn't want them in the scene so I just cut them off the stamp! Don't worry - I did keep them so I can add them back into the scene if I like. I hope you like my card and TFL! It was very easy to make the switch because the heads are almost exactly the same size! 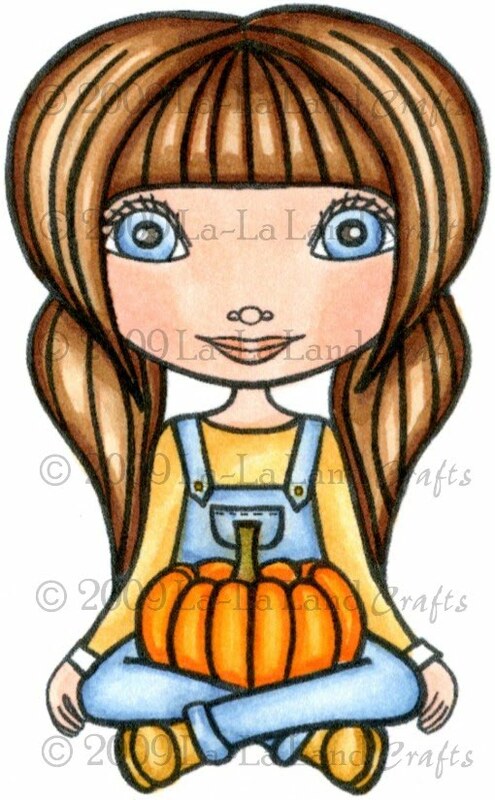 I just stamped and colored the head of Pumpkin Lala, then cut it out, leaving out the ponytails, and then stamped, colored and cut out Birthday Lala, leaving just a portion of her face so I would have something to glue the new head to. I also paper pieced the present, colored the ribbon and bow on it, and popped it up with a foam booster. 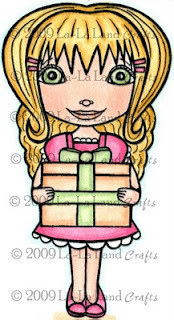 Then I stamped, colored, and cut out extra hands to go over the present. The sentiment is from Papertrey and I did it according to this genius tutorial by Debbie Olson. The sketch is from Sketchy Thursday and this card is also for A Spoon Full of Sugar - "Cute and Girly" and Papertake Weekly - "Say it with Flowers." Before I go, I want to let you know that whatever image the hostess uses on her project is 20% off for the week of the challenge, and this week it's Sitting Pretty Rosie! 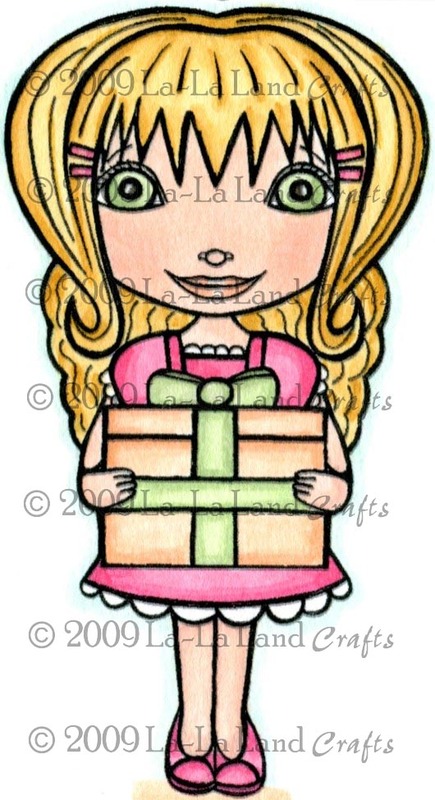 And since we have a new requirement that you must use a La-La Land Crafts image on your projects, don't forget that we have all these fabulous digi images available now! If you're looking for the Your Next Stamp Challenge #16, it's the post directly below this one. Thanks! It's time for another La-La's Weekly Wednesday Challenge! This week our theme was chosen by Kim and is anything goes (you just need to use a La-La Land Crafts image)! I used Mermaid Lala and a sketch from 2 Sketches 4 You. When I first looked at the sketch, there was an optical illusion and instead of seeing scallops, I saw waves so I immediately thought to use Mermaid Lala! Lala's top, hair shell and fin were all paper pieced and shaded with Copics, and the rest of Lala was colored with Copics. I added micro half pearls for her necklace and cut her out and popped her up with foam boosters. I cut the waves from 2 different pattern papers with the reverse side of my giant scallop scissors and then sanded the edges for contrast and also to look like sea foam on the waves. Before I go, I want to let you know that whatever image the hostess uses on her project is 20% off for the week of the challenge, and this week it's Mermaid Lala! And since we have a new requirement that you must use a La-La Land Crafts image on your projects, don't forget that we have all these fabulous new digi images available now! Yay! I have another Your Next Stamp Challenge today and I'm your host! One of my favorite things to do when stamping is to cut images out and pop them up with foam boosters or scrap cardstock: either the whole image, or just some parts, or both! So for this challenge, I'd like for you to "cut it out and pop it up!" I popped up the extra arms and the flower on the headband with scrap cardstock punches because I didn't want too much height, then I popped up the extra head with a foam booster. Finally, the entire Fhiona was cut out and popped up on more foam boosters. The sentiment is from the Mini Greetings set. Several days ago I got an overwhelming urge to make something out of felt so I sat and played a bit and came up with a card and gift set for a birthday! I drew the pattern myself, cut all the pieces from felt (since I'm not too serious into felt stuff, I just use the cheapo stuff from the craft store) and did a little stitching to make my own felt cupcake. The polka dots stamp and sentiment are both from Papertrey Ink. Here's a close shot so you can see the detail - I even put a tiny stem on the cherry! For the gift part, I wanted to try this adorable Tea Light Cake a long time ago but never got around to it, so I decided to try making one out of felt. It's not very fancy, but I really like how it came out! I just freehand cut the pieces to fit around the tea light and stitched everything together. The letters were all stitched freehand and I just rolled up little strips of pink felt to make the rosettes. Super easy, but (I think) super cute! I used Flower Bouquet Maya and my own sketch, keeping it pretty simple since I didn't want to knock your socks off with too much of these bright colors! Maya was colored with Copics and then I just layered a bit of cardstock, a white embossed piece, and some 'bellies. 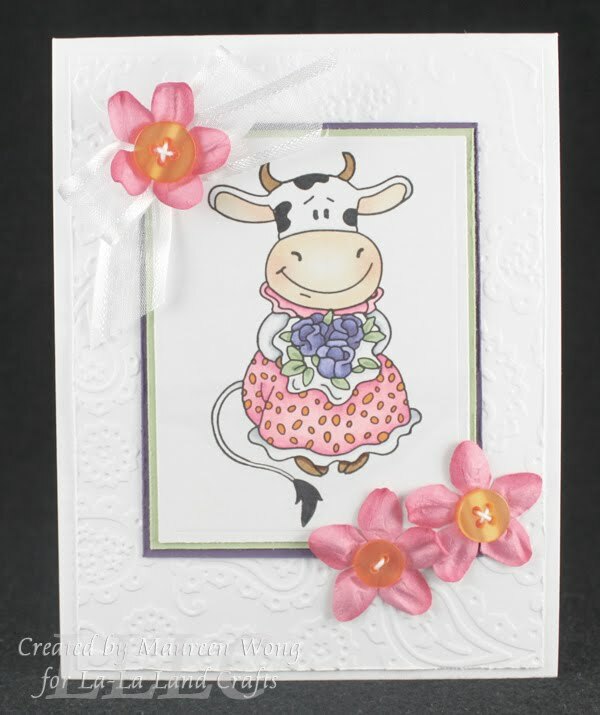 This card is also for Charisma Cardz - girly card with flowers, and Allsorts - animals. 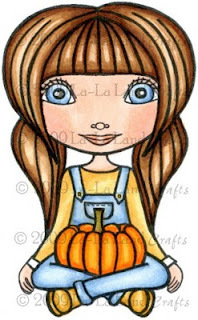 Before I go, I want to let you know that whatever image the hostess uses on her project is 20% off for the week of the challenge, and this week it's Window Lala! And since we have a new requirement that you must use a La-La Land Crafts image on your projects, don't forget that we have all these fabulous new digi images available now!